The seedlings that emerged in January and were brought into contact with the world and people in February are now truly taking on form. emerged and what has taken on an initial form. Like the promises of spring, each year reaches full development in summer. Fulfil the promises of youth in the summer of your life. Fully present in the world. Get involved in the outside world, but do so carefully. Consolidation – what have you acquired externally? It is now about being with people, the social component in your life. Throttle down. Working peacefully from your source. The year’s harvest is ripening on the field. The time of external growth has come to an end. Continue peacefully with what you were doing and wait for things to happen as they will occur automatically. The seedlings that fell to earth in autumn are purified in peace; in the earth the energy needed later for growth is building. Experiencing the winter solstice is essential as this is when you can reflect on the light returning. in which energy grows so that life can return by itself. and is therefore an excellent guide. confronted by change – every day, and in the most diverse of areas. the vast body of knowledge contained in the book. “A gorgeous book, very remarkable how western society is so remote from nature, whilst being integral part of it. with many beautful graphics, and clear explanation on how the seasons really work! Based on the teaching of the I Ching, explained clearly and speaking to you in a direct manner. Spring End - What should you bring to the world? Autumn Start - Consolidation - what have you acquired externally? Winter End - What wants to be born through you? Those who want to live a truly creative life need rhythm. Jaap Voigt did search for rhythm in his life for a long time, and found it. Jaap doesn’t call himself a Taoist, and certainly not a Taoist master. But it is in Taoism and it’s teachings that Jaap has found his inspiration for over forty years. 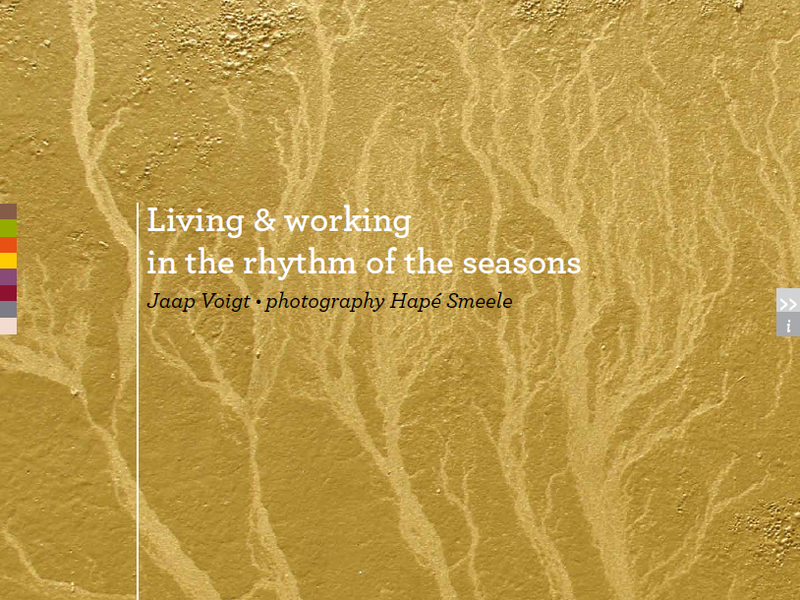 Jaap Voigt studied the influence of the seasons onto man for over 10 years and, based upon the I Ching and an old Chinese calendar, he designed a model to be able to live in the rhythm of the seasons. Hapé Smeele, as photographer, followed nature’s rhythm of the seasons with his camera for years. The book that resulted provides extremely valuable insights and advice for daily lives and work: When do you start something new? When can you best start a project or even start a company. When do you need to restructure? When do you retreat and when do you move forward? The model which is offered in the App (and English version of the book – coming out soon..), provides guidance for all to live in natural rhythm and helps us not only to keep on standing amidst all what challenges us, but to be truly creative in the midst of a very turbulent outside world, with its every increasing pace and illusion of continuous expansion. May the SeasonsRhythm App inspire you in your search for good rhythm. It’s there. You just have to seek it. Find it. And live it. Please note that this book and accompanying App are designed for use in the moderate climate zone on the Northern Hemisphere only.